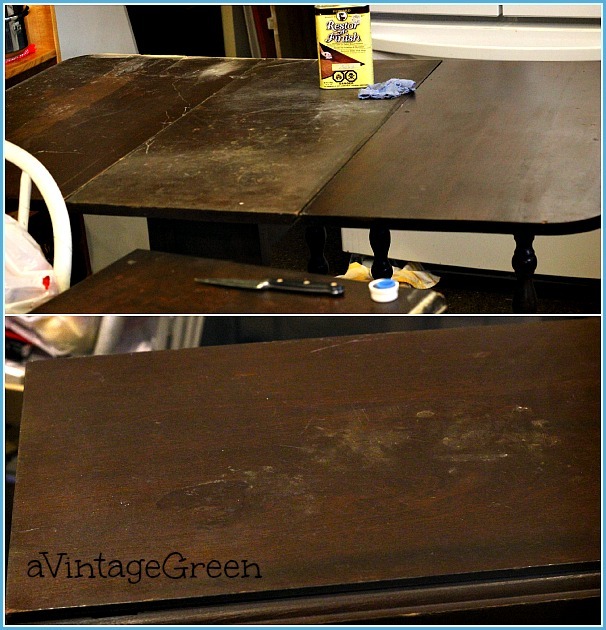 Thrifted finds - a drop leaf table with some issues and a teacart with a drawer. Below is the 'after' picture. Sometimes thrifted finds do not turn into great projects. Sometimes they get 'some' updo and then get ready for a new home. A bit of blue wall for Sally who is such a wonderful party host. The teacart has been very useful for a few months, the side leaves have made a great work surface (covered with a paint tarp) for the 'shelf painting' project as well as a place to put 'stuff'. The table has been just as useful as a work surface. BUT. Time to leave. Cleaned, cleaned, cleaned then Howard Restor a Finish. Holly (below) is from the Como Lake Presbyterian Church Bazaar this weekend. Every year there are wonderful branches of fresh holly for sale, as well as baking, Christmas and Homemade Crafts and my favourite - a White Elephant Sale. 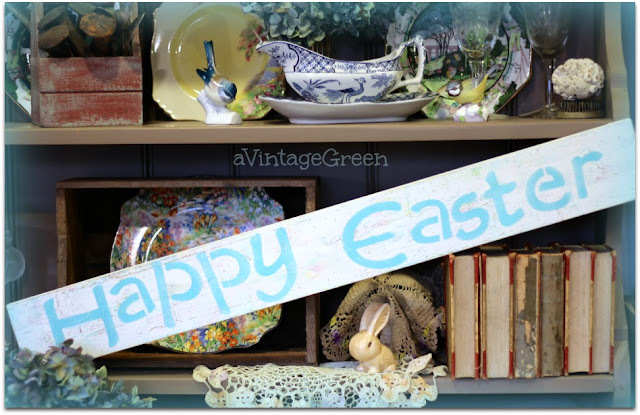 I had a wonderful time, found some great treasures, several books, some gingersnaps too. More about the treasures another post, back to the table and teacart topic. Lots of scratches and worn areas. Tabletop below. Teacart (below) showing quite a bit of removed surface. Some sanding had happened previously so getting a good 'restore finish' happening wasn't easy. Added a bit of Walnut Gel in the most worn areas. Then tried Restor a Finish again. Teacart top after Restor a Finish. Not 'perfect', but ok and pretty in its worn way. Another view in my booth. The table has lots of issues, tabletop wood joins are starting to separate and one edge is yellowed. The teacart has lots of wear on the edges and some areas a just plain worn. Sometimes I just need to say no, and I did. 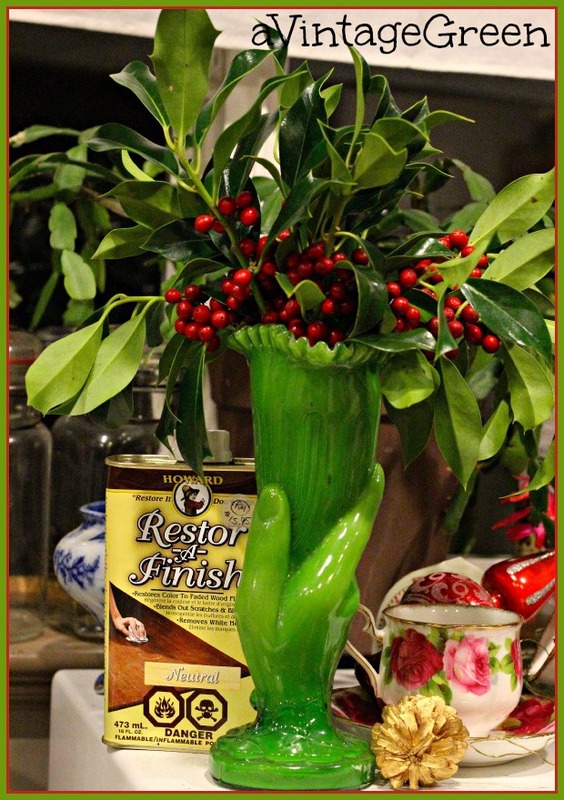 Some projects just don't work despite our best efforts, love the green hand shaped vase, so unusual. 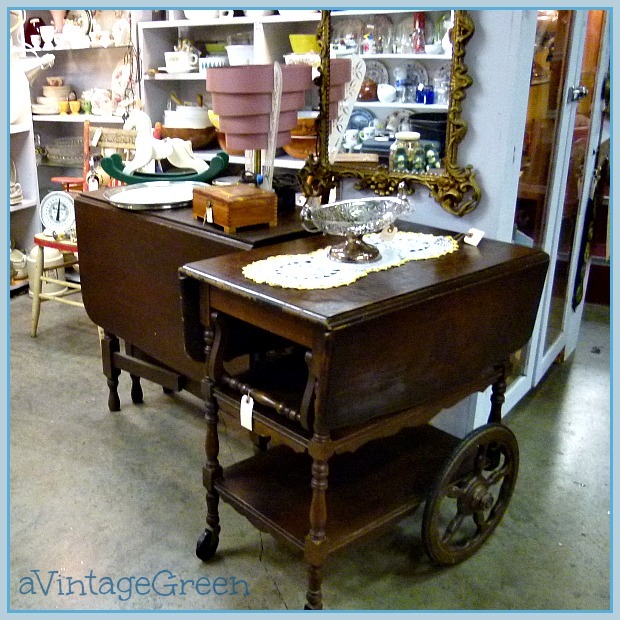 I do like the tea cart. Some would shabby chic it, but I always appreciate the character of natural wood. 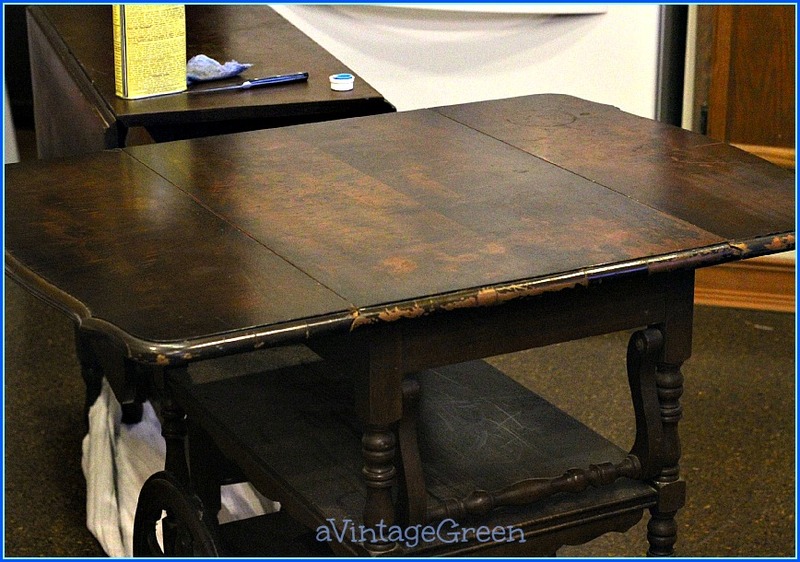 My mom used to have a drop leaf table just like this one. 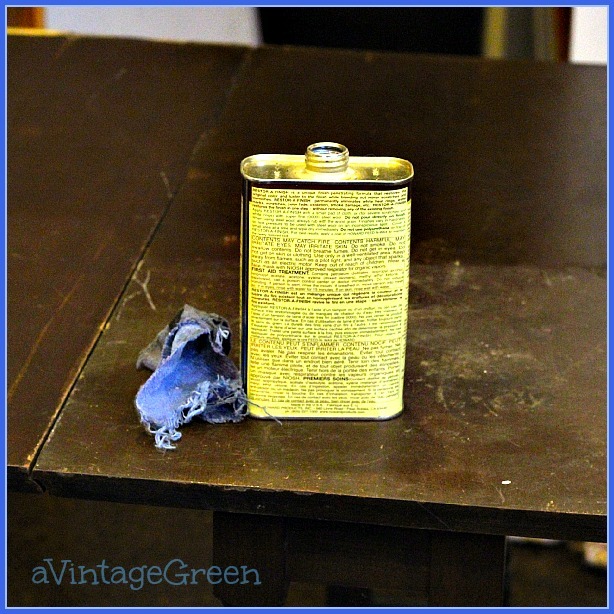 We always used Old English Scratch Remover on it, but your product is working just fine. Some lucky one will love it for years. 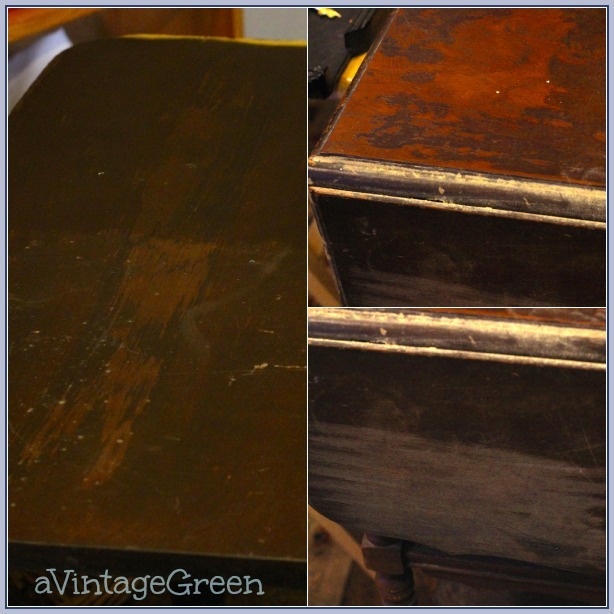 Sometimes vintage pieces don't recover too well from refinishing and a couple of coats of paint is required to hide the years of abuse. A shame really, isn't it, but someone will come along and think the pieces look great just the way they are. From a Kenny Rogers song!!! We all have to learn when to let go. 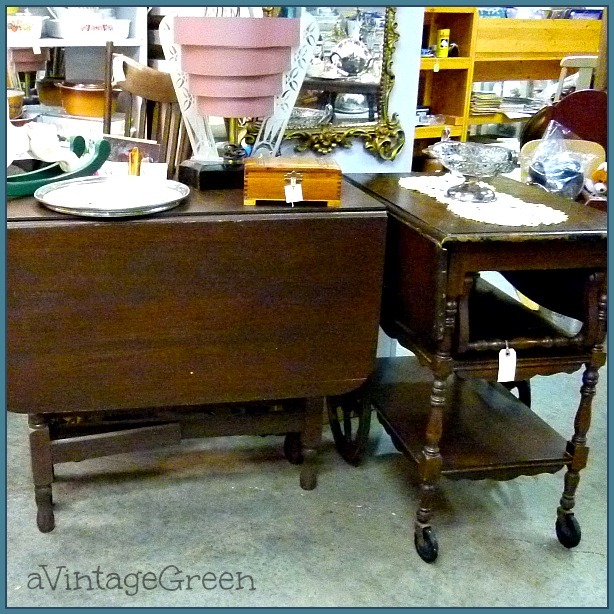 I have a tea cart on my list of things I really want to find to sell. (I know. That's a weird list to have.) I think the work you did on the cart was just enough to turn the flaws into character marks! Its all about bringing a piece back, and that you certainly did. Some pieces will carry their scars as character. You do great work! Oh lovely! And a delightful visit via The Dedicated House. Thank you for the fun ideas and examples.